Question: How did Fox News attempt to discredit the recent U of Maryland study that found Fox viewers to be a comparatively misinformed bunch? I tried to find out how other news sources had handled similar studies or findings that implied continuing inaccuracy in their reporting, but strangely enough, I couldn’t find any. Sure, there were lots of complaints about different news organizations misreporting specific stories, and lots of individuals claiming left and right bias in the mainstream media, but there was no similar academic study finding the viewers of a specific news channel to be consistently more misinformed than non-viewers. In this journalistically embarrassing category, Fox News stands alone. This is where Fox’ claim of liberal bias comes in handy, though. Ailes and crew refute the study by claiming the professors who designed the study are liberals who have it in for Fox, thus discrediting the study and reinforcing anti-intellectualism in an inspired Fox News twofer. In addition, they claim liberal or Democratic bias in the experts who determined the study’s correct answers. Finally, they trot out their timeworn claim of left-wing bias in the mainstream media. If it ain’t the professors, it’s the experts, claims Fox. If it ain’t the professors and experts, it’s the reporters reporting the story. Presto–study refuted. It’s almost poetically foolproof, in a wild-eyed paranoid kind of way. Though we probably didn’t need an academic study to confirm our nagging suspicion that Fox just might not be on the up and up, it’s nice to have as a tangible reference. It also serves as a reminder that our democracy has never before seen such a strange, potentially calamitous phenomenon as Fox News, where facts are selectively partisan and the viewer comes away from the TV with an alternate universe firmly planted in his head. Take the subject of global warming, for instance. Scientists overwhelmingly agree that global warming is likely due to man’s activity. They also believe that its effects, left unchecked, will lead to catastrophe for life on our planet. Further, they agree that our only hope lies in immediate action to counter its effects. Meanwhile, back at “Facts Schmacts Central,” 60% of regular Fox viewers do not believe that most scientists agree global warming is even occurring. That’s occurring, mind you. When it comes time to adopt anti-warming measures or elect candidates who take climate change seriously, how will 6 of 10 Fox News viewers vote? So much for immediate action. Comments from “The Truth About Fox News Viewers” at conservative Free Republic.com demonstrate how Fox News’ dueling facts and “circle the wagons” mentality plays out in the world of the Fox faithful. “Amazing. 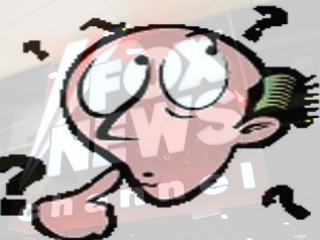 They are now claiming that showing skepticism of dubious claims indicates narrow-mindedness,” writes Fox viewer, Tribune. Through the magic that is Fox, consensus on climate change formed by the National Academy of Sciences, the American Meteorological Society, the American Geophysical Union, and the American Association for the Advancement of Science are reduced to “dubious claims” By Fox viewers. “Yep, time to re-educate all the nonwatchers of MSM in Progresssssive [sic] Education Gulags!” says Leo Carpathian, raising the argument to neo-John Birch Society hysteria. “We must support Conservative news outlets at every opportunity. The Marxists will continue to attack from every direction with every method possible,” writes Blam, proving that Joe McCarthy lives, and that Fox-brand paranoia is contagious. Though the logic escapes me, a number of commenters point to Fox News’ comparatively large ratings as proof of its accuracy. I may be nitpicking here, but to me the only thing Fox News’ large ratings prove is that Fox misinforms a lot of people. A news service pumping half-truths and nowhere-near-the-truths into the public consciousness 24/7 can’t be good for a democracy and its requisite informed electorate, can it?